Dil lon could be described as one of Scotland’s best kept secrets, a prolific writer of prose and drama who has never really had the recognition he deserves. Perhaps this is because he commits that cardinal sin of being genuinely funny, something which many see, wrongly, as less than serious. His debut novel, ‘Me and Ma Gal’, showcases this aspect of his writing brilliantly. It’s a book which moves at a breathless speed, but what is Dillon’s greatest strength is his mastery of language. If you ever thought that writing in Central Belt Scots is somehow less than artistic, then you must read this book. 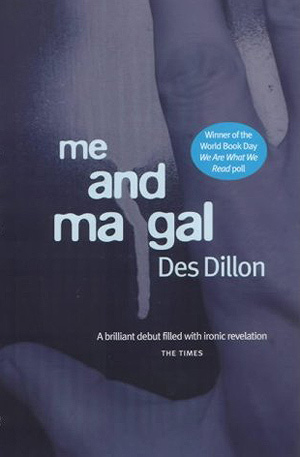 ‘Me and Ma Gal’ is the tale of Derek and Gal, best friends for ever, which is the way of it in those days where summer holidays lasted forever and the future is something which happens to other people. While the tales of walking down pipelines, staying clear of the bigger lads and their strange obsession with girls, learning to run sideways down hills, playing places which their parents specifically disapprove, and the moral dilemma which was collecting eggs, will spark memories in many readers, it is the command of the language of the playground which makes the stories ring true.  Archived in The Life, Books and tagged Alistair Braidwood, Des Dillon, Me and Ma Gal, Scotland, Scottish, video. Bookmark the permalink.